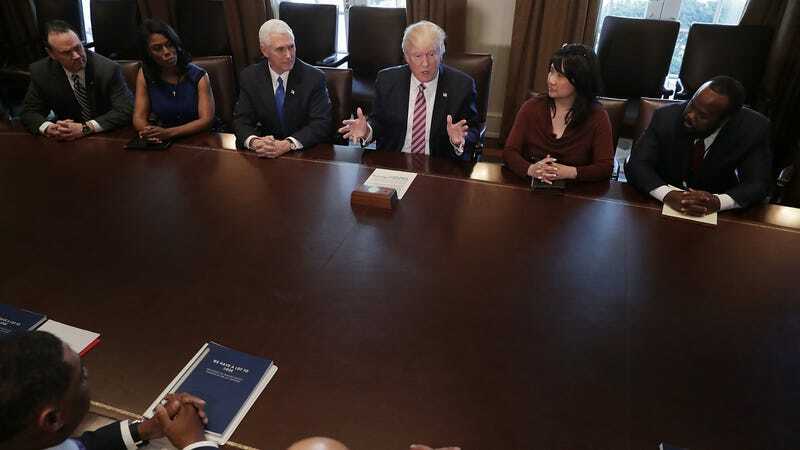 Omarosa, second from left, Cabinet Room. Image via Getty. The White House, specifically an Omarosa-Free Zone circa December 2017, continues to be plagued by Apprentice star-turned-former White House staffer Omarosa, with her everlasting affinity for appearing in places she does not belong and MAKING A SCENE. The New York Daily News reports that Omarosa, who was allegedly “physically dragged” out of the White House (read: “resigned”), in December, may have recordings of White House meetings. Because she enjoyed secretly recording everything, which “everyone knows,” which is both insane and absolutely probable. But a White House staffer tells the paper that it’s highly unlikely she would have been at a meeting of any significance to the Russia probe, but knowing her, she will find a way in. She has reportedly been meeting with celebrity attorneys Lisa Bloom and Monique Pressley. It is also reportedly thanks to Omarosa that the White House has now instated a no-iPhone policy. Her legacy lives large.